PROMOTES OVERALL SCALP HEALTH: The hand-held Scalp Revival Stimulating Therapy Massager is here to help take your scalp health to the next level! Gentle massaging action helps to stimulate your scalp and promote overall scalp health. 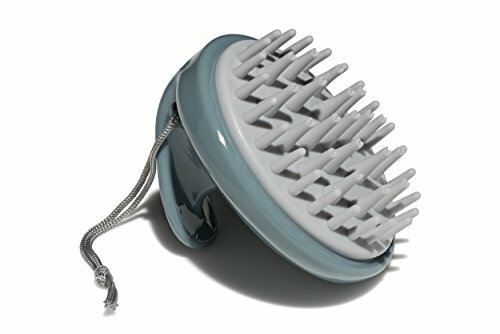 FOR ALL HAIR TYPES: Whether you have dry hair or oily hair, straight or curly, this scalp massager is ideal for you. It can be used alone on a dry scalp or paired with your favorite Briogeo shampoo, oil, or treatment for a massage therapy experience in or out of the shower. EASY TO USE: Apply shampoo, massage oil, or treatment as usual and distribute throughout the scalp and hair then simply hold the massager in your palm, gently press the rubber tips to the scalp with medium pressure and massage. Repeat on all areas of the scalp. The massager can be used on wet or dry hair, with or without product. Avoid large circular motions to prevent tangling. OUR PRODUCTS WORK BEST TOGETHER: Briogeo offers a complete line of Scalp Revival products that work in tandem with our Scalp Massager to keep your hair looking great and promote an overall healthy scalp. Try the other products in the Collection: Scalp Revival Charcoal + Coconut Oil Micro-Exfoliating Shampoo; Scalp Revival Charcoal + Peppermint Oil Cooling Jelly Conditioner; Scalp Revival Charcoal + Biotin Dry Shampoo; Scalp Revival Charcoal + Tea Tree Scalp Treatment. ABOUT BRIOGEO: Briogeo offers a high-performance hair care collection that is naturally based, yet performance driven to provide visible results. Beauty shouldn't be compromised by harsh or harmful ingredients, which is why all Briogeo formulas live up to their performance claims - providing the vibrant, beautiful and healthy hair we constantly strive to achieve.